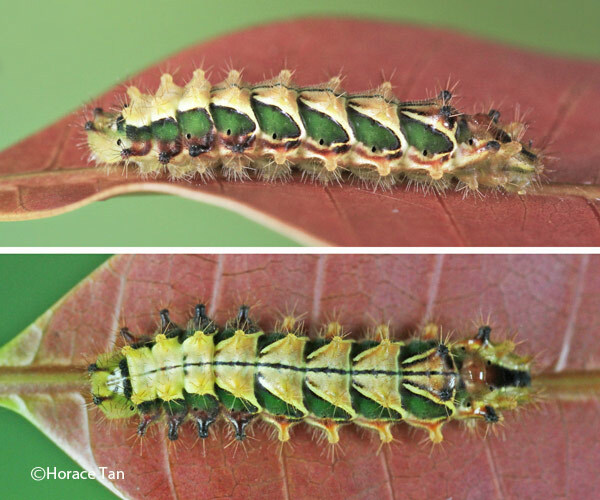 This 10th instalment of our Butterflies' Larval Host Plants series features Mangifera indica (Mango), a species of the family Anacardiaceae (Cashew or Sumac or Poison Ivy family). This family includes 83 genera and 860 known species, several of which are of economic importance (eg. Cashew, Sumac and Mango). 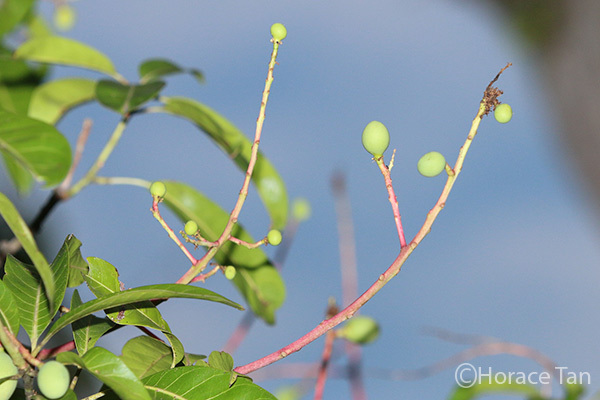 The genus Mangifera contains about 69 species which occur mainly in subtropical and tropical South and Southeast Asia, and a fair number of them bear edible fruits. The species name "indica" has the Latin meaning "of India". 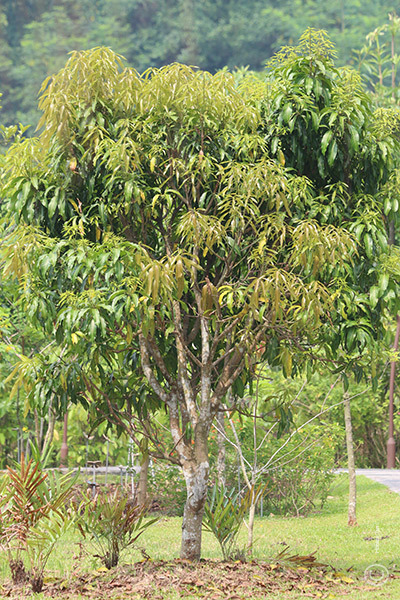 A young, cultivated Mango tree in the Jurong Eco Garden. Mango is known as the national fruit of India, Pakistan and Philippines. 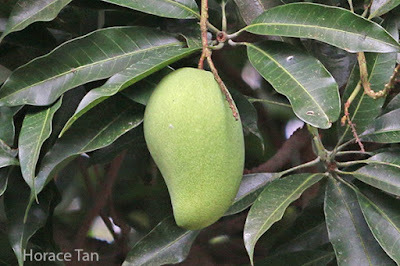 Originated in South Asia and domesticated in India at around 2000 BC, cultivated varieties of Mango have been brought to other tropical and frost-free subtropical regions in East Asia, Southeast Asia, Africa and South America. 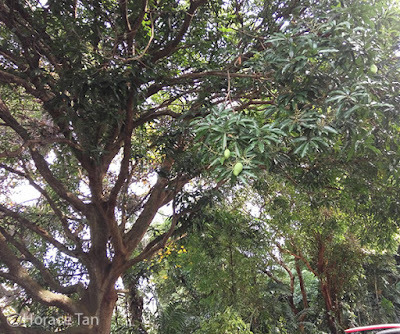 In mainland Singapore, Mango trees used to be a common sight in fruit farms or rural villages, but nowadays they are more likely found as wayside trees, as cultivated plants in public parks and gardens, or in households on landed properties. Some wild specimens can also be found in abandoned farmlands, wastelands and along the fringes of nature reserves. 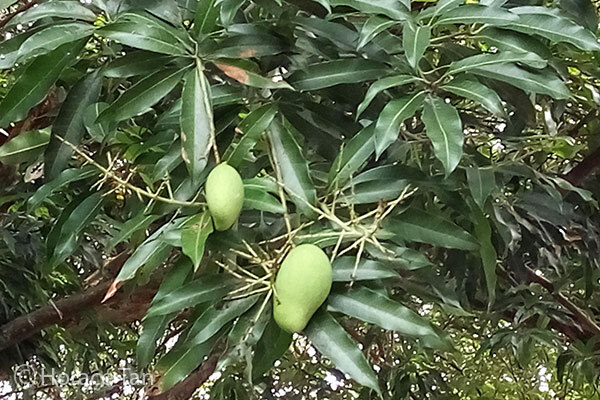 Besides the obvious use of the Mango fruits as food, various parts of Mango have been used in traditional medicine for their anti-diuretic, anti-diarrheal and anti-emetic properties. On the flip side, the fruit peel contains allergenic urushiol which could causes skin rash for persons sensitive to such allergens. Synonyms : M. amba, M. anisodora, M. austro-yunnanensis, M. domestica. Other Local Names : Cuckoo's joy, Mangga, Mammuang, Manga, 芒果. Larval Host for Butterfly Species: Euthalia aconthea gurda (Baron), Rapala pheretima sequeira (Copper Flash). A flowering Mango tree in a public housing estate in Jurong. 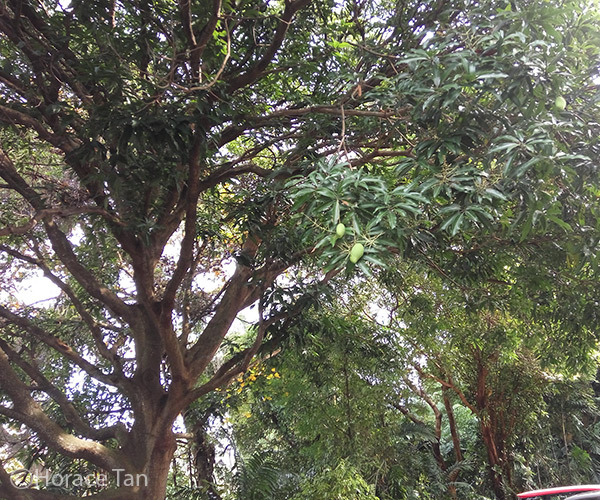 A large Mango tree found in Mount Faber Park. 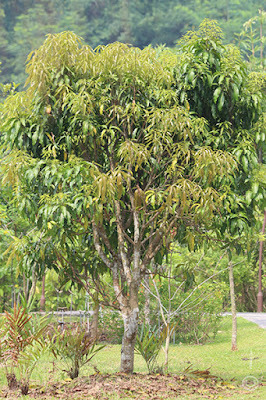 Mango is an evergreen tree with a dark green and spreading crown. It can grow to a large tree up to 38-45m in height with its trunk 60-120cm in diameter. The dark grey bark is rough with vertical fissures. It is astringent and is employed against rheumatism and diphtheria in India. The wood has been used in plywood and low-cost furniture. Both young and mature leaves of a Mango tree. 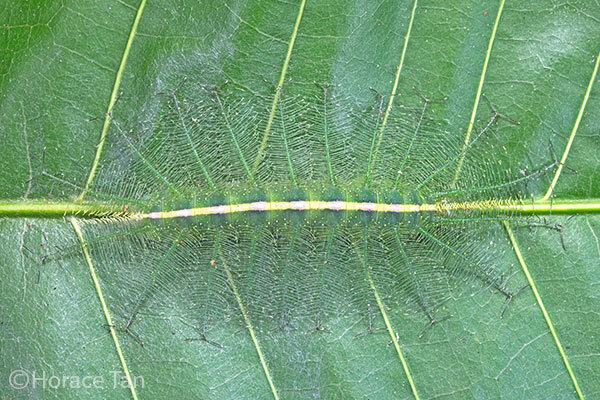 The leaves are elliptic, elliptic-lanceolate or linear-oblong in shape, 9-40cm in length and 2.5-8 cm in width. They are simple and alternately arranged, and clustered at the tips of branches. Young leaves are initially reddish brown, then turning yellowish green to dark green when fully matured. 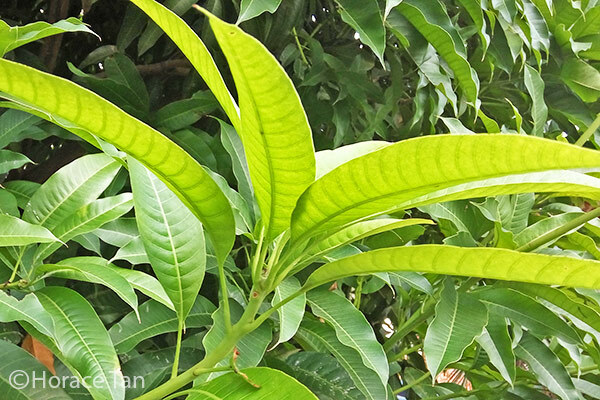 In some places, young and tender leaves are used to make an infusion for treating early diabetes. A closer view of a branch of a Mango tree bearing both young and maturing leaves. 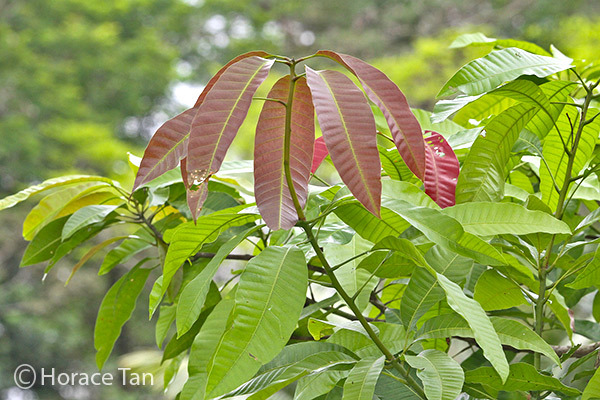 The clustered arrangement of leaves at the tip of a branchlet of a Mango tree. Flowers of Mango are small, 5mm in diameter, white-yellowish, and occur in terminal panicles. These bisexual flowers attract pollinators such as bees, flies, ants and bats. A terminal panicle bearing flowers and flower buds. 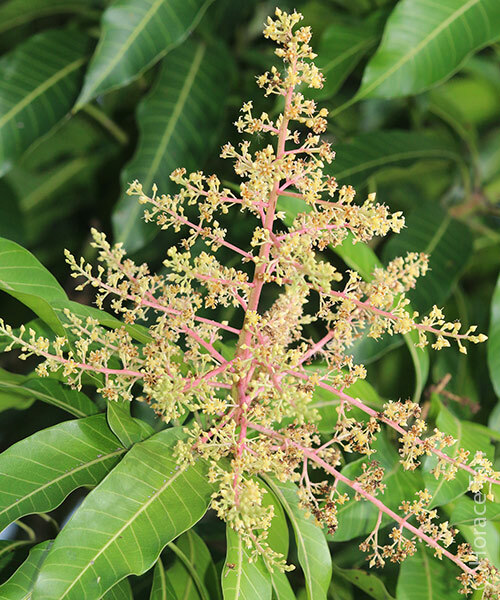 Closer view showing flowers and flower buds of a Mango tree. 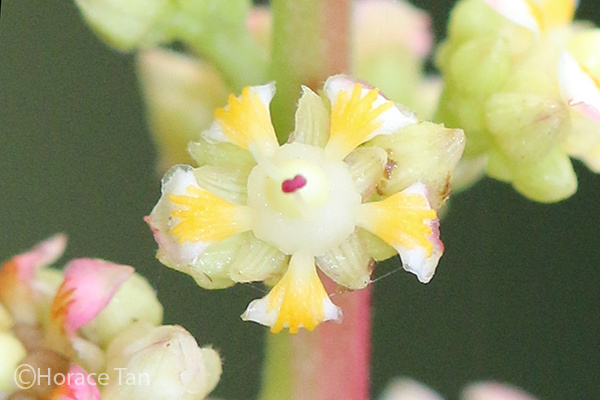 A close-up view of a flower of Mango. Each mango fruit is a green-yellowish-red drupe (a fleshy fruit with thin skin and a central stone containing the seed) with edible flesh, 5-15cm long. The shape could vary from round, oval to kidney-shaped, depending on the cultivated varieties. Young fruits are green in colour while mature fruits are yellow to orange. The soft pulp is typically sweet and juicy. 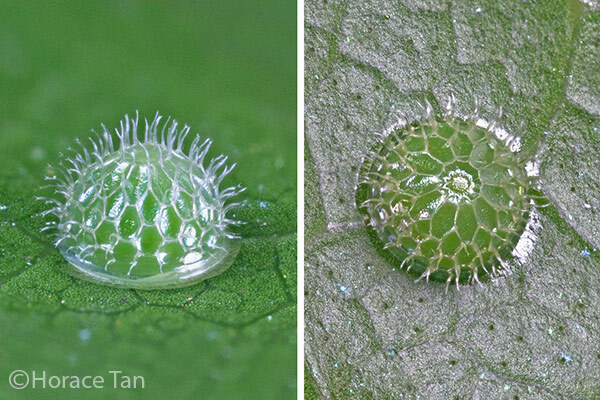 Each fruit bears a single, inedible seed encased in a fibrous coat. 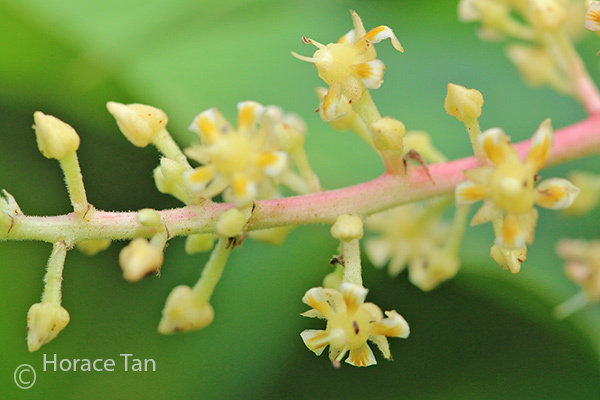 Both the seeds and flowers of Mango have been used in the treatment of diarrhea. Tiny young fruits of Mango. Developing fruits of Mango, yet to reach their mature size. Close-up view of a fully developed Mango fruit. 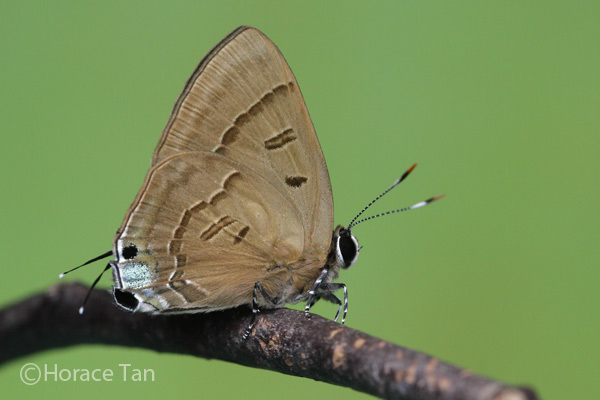 In Singapore, the Mango tree also serves as the larval host plant for two butterfly species: Baron (limenitid) and Copper Flash (lycaenid). Eggs of the Baron are laid on the surface of a mature leaf, whilst those of the Copper Flash are laid on the young leaves or young shoots of Mango. Two views of an egg of the Baron found in Mount Faber Park. 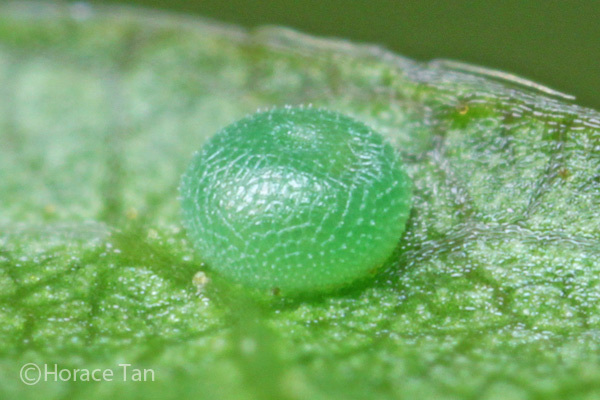 A close-up view of a tiny egg of the Copper Flash. Caterpillars of the Baron feed on mature leaves of Mango and typically rest on the leaf upperside with its body axis aligned with the main vein of the leaf. 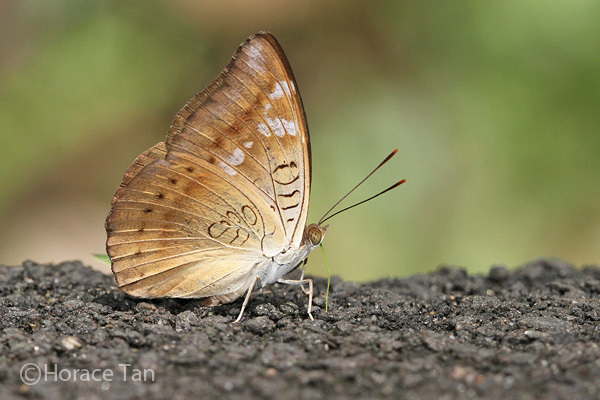 The pale dorsal band and its feathery appearance help to conceal the caterpillar from prying eyes. 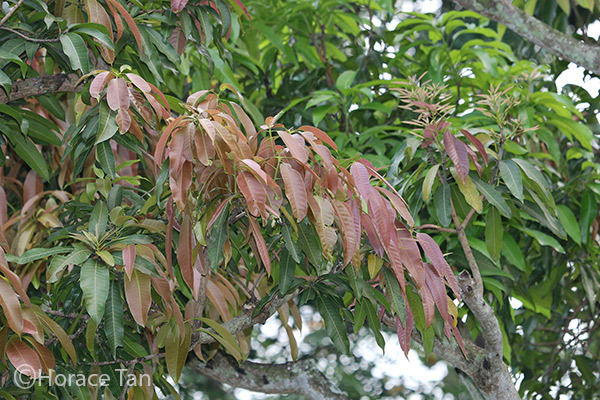 Copper Flash caterpillars, in contrast, feed only on the young and tender leaves of Mango. Typically their presence is indicated by a number of attending ants. 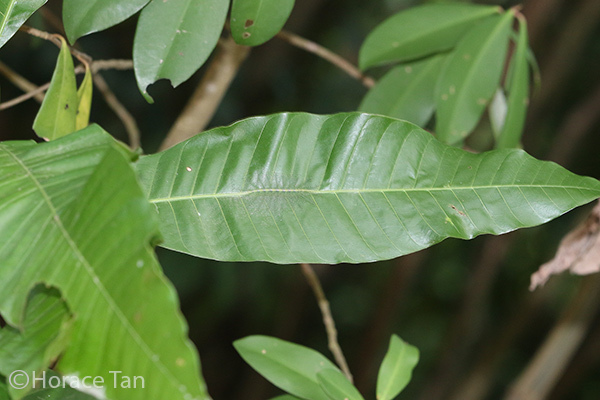 A mature leaf of Mango in Mount Faber Park, with a final-instar Baron caterpillar resting on it. Can you spot it? 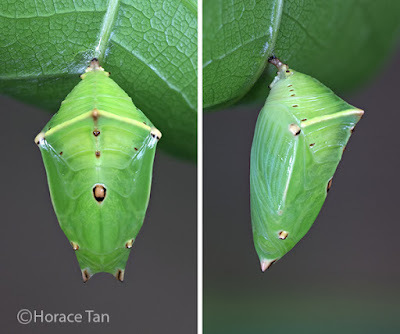 A closer view of the final instar caterpillar of the Baron. Two views of a final instar caterpillar of the Copper Flash resting on a young leaf of Mango. Caterpillars of the Baron typically pupate on the underside of a Mango leaf, whereas those of the Copper Flash will do so on a leaf surface or in leaf litter. Two views of a pupa of the Baron. 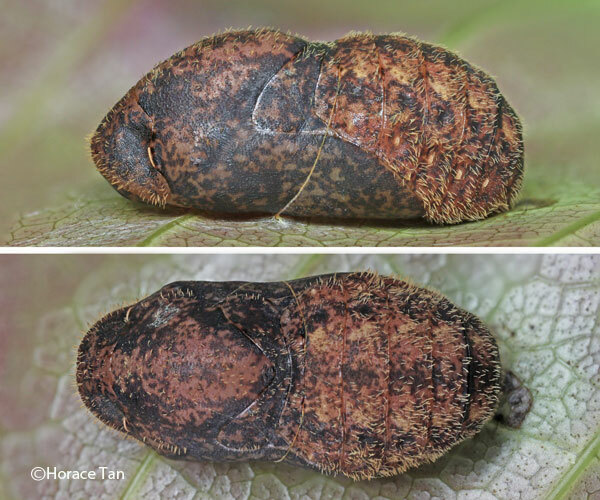 Two views of a pupa of the Copper Flash. Nature Loves You - Mangifera indica. 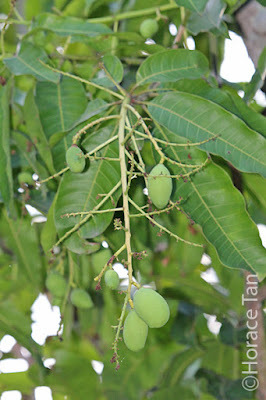 Pharmacognosy Reviews, 4(7), pp.42-48, 2010: Mangifera indica (Mango). Useful Tropical Plants - Mangifera indica. 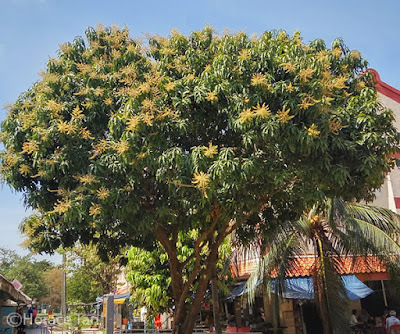 Uses of Mango Leaves, Seeds and Bark.